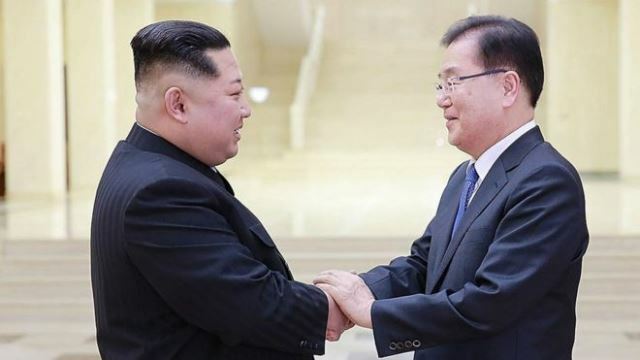 Talks between North Korean leader Kim Jong Un and a South Korean delegation reached a “satisfactory” agreement on a potential summit, North Korean state media reported on Tuesday. Kim hosted the South Korean delegation, including President Moon Jae In’s top security advisor Chung Eui Yong, at a dinner on Monday night and held an “openhearted talk” with them, KCNA reported. The discussions included the summit, ways of “easing the acute military tensions on the Korean Peninsula” and of continuing a dialogue, KCNA wrote in an English-language article. The South Korean delegation, which also included spy chief Suh Hoon, also handed over a personal letter from Moon to Kim. It was not clear if the two sides spoke about the North’s nuclear weapons programme or the possibility of talks between Pyongyang and Washington. Moon has previously said that he would only meet with Kim provided he agrees to talks with the US. North Korea launched a charm offensive on Seoul earlier this year, with experts suggesting it is looking for a way to drive a wedge between South Korea and its allies the US and Japan while easing international sanctions against Pyongyang. The dinner marked the first time that Kim has met with high-ranking officials from the South since he took office in 2011 and comes after his sister Kim Yo Jong visited South Korea during last month’s Winter Olympics. Kim’s rarely seen wife, Ri Sol Ju, and Kim Yo Jong also attended the four-hour dinner, according to South Korean news agency Yonhap. The South Korean delegation was due to return home on Tuesday after further meetings with North Korean officials in Pyongyang, Yonhap reported. “We are willing to engage North Korea to emphasize our position that the complete and verifiable denuclearization of the Korean Peninsula is non-negotiable,” it said. Tensions on the Korean Peninsula peaked last year, as Pyongyang violated UN resolutions by launching a series of ballistic missiles and carrying out a nuclear test in September. Pyongyang also claimed it had an intercontinental missile capable of reaching the entire US mainland and which could be armed with a nuclear warhead.